As you may or may not know, Samuel has been obsessed with "Back to the Future" for about six months now. About three months in, I decided to embrace it. A few weeks ago we joined the Delorean Mid-Atlantic Club. Okay, we don't technically own a Delorean, but we figured this was a first good step. There was a club get-together in Lancaster County, Pennsylvania this weekend, so, being club members and all, we went. It was the first time Samuel had seen a real Delorean. About 15 of them, actually. He and Ethan got to sit in one and ride in one. And the highlight was the one that was customized to look like the time machine from "Back to the Future." Well, as if seeing real Deloreans wasn't enough, we spent the rest of the day at "Hersheypark in the Dark," Hershey Park's Halloween-themed promotion. It was a little wet--we waited out a couple of downpours--but the upside was that the lines were short. And we had the arcade all to ourselves. All in all, a big success. 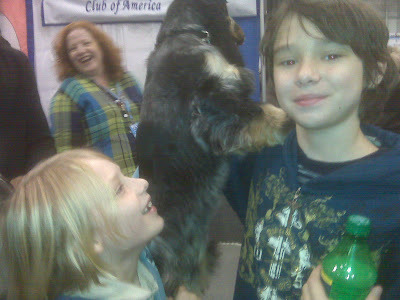 I took the boys to a dog and cat convention at the Javitz Center today. It was called "Meet the Breeds," billed as "the world's largest showcase of cats and dogs." 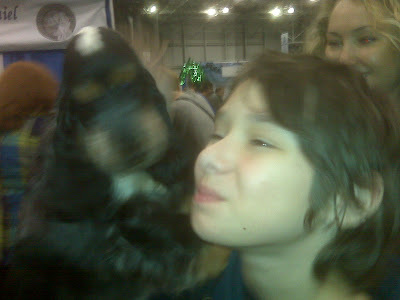 Sure enough, there were a whole bunch of booths set up, each devoted to a breed of dog or cat, and almost all containing a live specimen to be petted, or, in Ethan's case, engage in full-open-mouth kissing. Our favorites were the English Cocker Spaniel, Bloodhound, and American Cocker Spaniel. We saw what Kahlua and Bailey might look like if someone actually groomed or even brushed them occasionally. 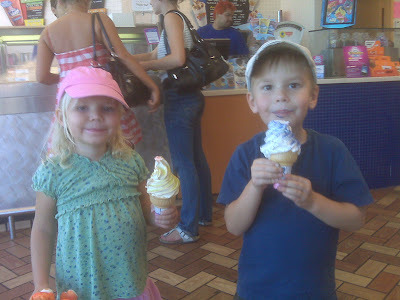 And of course there were little kids all over the place, plus Haagen-Daz, frozen lemonade, and popcorn. Yeah, we blew $50 or so, but we managed to avoid coming home with a Bloodhound or a toddler. Samuel's back from his 3-day school field trip to the wilderness. He brought back two large sticks. He said the bugs weren't too bad. Ethan asked if any bugs had touched the sticks. Samuel said no. While Samuel was gone a new video game came for him in the mail. Samuel ordered it because he'd found a website that converts it from "Grand Theft Auto: Vice City" to "BTTF: Hill Valley." 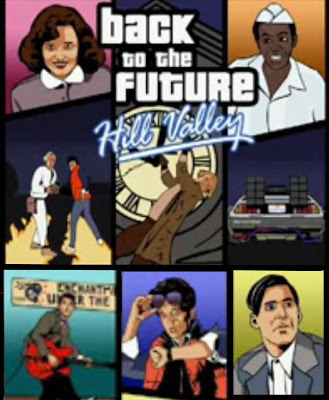 The cars become DeLoreans and Vice City becomes Hill Valley. He's been on the computer since he got home. Every twenty minutes or so he shouts, "I found the junkyard!" or "I got the plutonium!" It's nice to have him home. I got a “folded and gathered” copy of my first book, How About a Kiss for Me?, in the mail from Dutton for review. It looks like a real book. 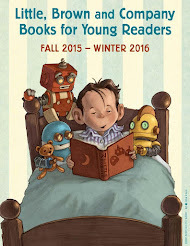 Publishing date is June 10, 2010. Hurray. Jen has been very busy at work. She always seems to be getting up at 6:30am, and by the time the boys and I wake up at 7:15 she is walking around in a nice suit reciting lines from a presentation to herself. Even when she has a day off she is stressed about all the work she is not doing. I don't seem to have that particular issue. Samuel left yesterday morning for a 3-day trip with his class to a nature/wilderness retreat in upstate NY called "Ashoken" (translates from Native American as "Damn, it's cold"). He was excited to go, but a little anxious about being away from home for 3 days, and a little anxious about the possibility of seeing bugs. Ethan got a new book from Barnes & Noble-—the latest installment of “Diary of a Wimpy Kid,” which is his favorite book series. He is going to miss Samuel a lot for the next couple of days, but we’ll try and keep him distracted and give him lots of attention. He slept in our bed last night. Well, Kahlua is doing fine, but Bailey had eye surgery yesterday to correct something called “cherry eye.” The vet called in the middle of the day and informed us that he also needed to have an impacted tooth removed. So...I'm just gonna have my paychecks automatically desposited to the vet's checking account. Last night I put Ethan to bed, and he asked me to put my arm around him to help him go to sleep. Every time he does it I feel blessed: first, because it makes me feel needed, which is one of the best parts of being a father; and second, because I know that each time he asks may be the last. He's eight years old, and like Samuel before him, he's at the tipping point between little kid and medium kid. It's a great time to watch him becoming stronger, more agile, more confident. And yet it's nice to know that in the midst of all this growing up, I'm still needed now and then to bring him a sense of safety and comfort, late at night, when the monsters wage their last hurrah before their extinction. "Officer and a Gentleman" is done! Ethan's friend Lucy came over today and we finished shooting the movie, edited it, and posted it on YouTube. So until they delete it for music copyright infringement...enjoy. House lights down. Roll tape. I'm on the plane home from three days in LA. 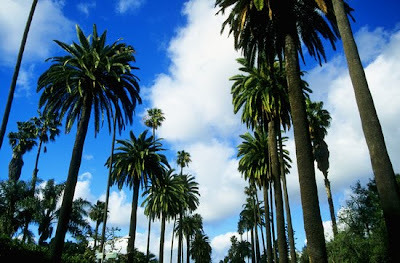 I got in on Thursday, checked into the Beverly Hilton, went for a run through Beverly Hills, lifted weights, then ate the $6.50 Snickers minis in my hotel room mini-bar and went to bed. Friday I helped lead a sales training session, which went well. Business completed, I spent Friday evening with my sister April, her husband Marty, and their kids. Ryan is 5. He likes Thomas the Tank Engine, pirates, and Bakugan. Addie is 4. She likes princesses, the color pink, and...um...princesses. Today (Saturday) April and Marty both had to work all day, so I babysat Ryan and Addie. I think April felt bad that she stuck me with the kids all day. I don't think she realized that that was my ideal scenario. We had breakfast at Denny's (Ryan: "Don't tell Mom I had chocolate milk"). 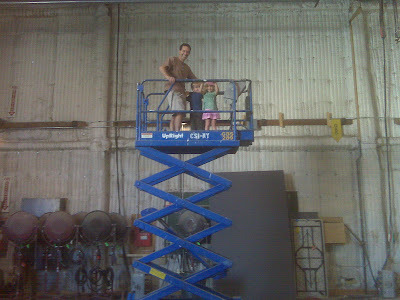 Then we visited Marty on the CBS lot in Studio City, where he works on the set of "CSI: NY." Ryan, Addie, and I had Happy Meals at McDonalds (I ate the rest of Addie's burger after she inadvertently ate a pickle, which she found disgusting). Then we drove to Hollywood, where we met my 21-year-old niece Mary and her roommate, who are both dancers in a local ballet company. We hiked in Griffith Park, got some color-changing ice cream at Baskin-Robbins, then the kids napped on the long drive back to the Valley. I'm on the redeye back to NYC. It was kind of hard telling them goodbye, especially with the big hug from Addie. But anxious to be back home to my own little family.